This episode was all about the truth. All but the biggest secret has been revealed. But the question is, does that secret even matter anymore? Hyejin really shines in this episode. She gets one hell of a knock but bounces straight back up. 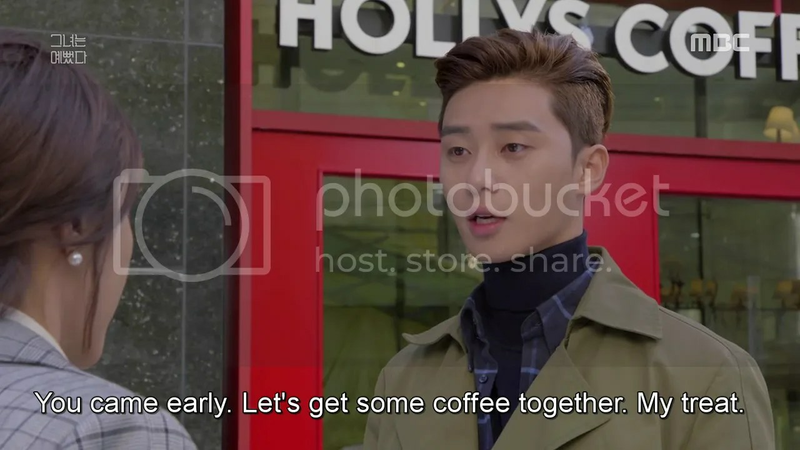 Seeing Hari meeting with Sungjoon behind her back is bad enough but hear him call her “Hyejin” is the final nail in the coffin. It’s both interesting as sad that the first person she calls is Shinhyuk. Because she’s just so comfortable around him, and because the person whom she’d normally talk to about everything is the one who’s just hurt her so badly. She cares about Hari and knows her well enough to wait for her to tell the truth herself. Friendship, to Hyejin is worth fighting for, regardless of whether the man she likes is involved. I mentioned in an earlier review than Hyejin is without artifice and this episode really, really showed that, especially in her interactions with Shinhyuk. She’s open, warm and genuine in her gratitude that he’s around, and her worry that he got hurt, because of her or not. 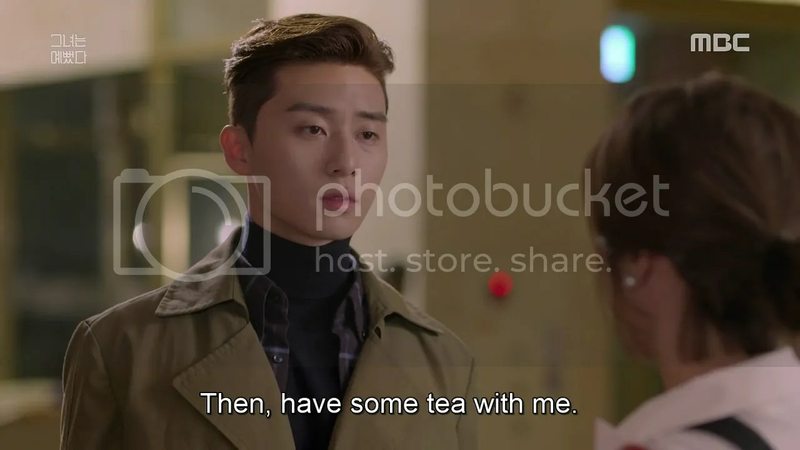 Hilariously, the shoe’s on the other foot with Sungjoon. I cheered so hard when she nonchalantly admitted that she liked Sungjoon and was certain that he liked her as well. Which is why watching her flail about around Sungjoon was utterly hilarious. Because as over-the-top as it may seem, it’s actually quite realistic. I’ve seen perfectly rational, confident, sane individuals go utterly mental once the object of their affections enters the room. And thankfully, in Hyejin’s case, it goes both ways. I adored Sungjoon this episode. Gosh was he perfection today. Especially when that love song came on and he jumped as though the singer had read his mind. And I love that he didn’t even know that it was raining. So it wasn’t that he was pushing himself using the memories he had with and of Hyejin to drive through but that he simply didn’t notice the rain because he was so focused on getting to her. Except he never quite gets past 3, does he? Thank goodness the man’s so forgetful (and that no one else in the office wants to bring him his suit, and that Shinhyuk wasn’t there at the time) or him and Hyejin would never have gotten any alone time. But once he got started on number 4 *swoon* that was so wonderful to see. The man is so incredibly gentle that I wonder why he behaves like a rampaging bear in the office (GIVE ME EXPLANATIONS SHOW!). He doesn’t care about how stupid he may look, and he’s just ready to put his heart on the table. He may have drawn parallels between her and his Hyejin at first, but that’s not why he likes her. This isn’t about how pretty/ugly she is but that he likes being around her that he’s himself around her. Sungjoon knows that she feels something but isn’t sure whether she’s uncomfortable due to just feeling awkward around him or because she might like him in return. And he doesn’t chase after her when she leaves his apartment ahead of him, giving her space to come to terms with what he’s said and make her decision. It’s interesting how having his feelings on the table changes their dynamic. Hyejin doesn’t go the noble idiocy route that way another heroine might, despite clearly being aware that Hari does feel something for Sungjoon. Hyejin likes him and he likes her. Hari’s going back to ‘her rightful place’ on the sidelines of the Renoir painting while Hyejin and Sungjoon finally get to dance. This is their story and she’s ready to grasp it (it ties so nicely with her dream of becoming a children’s author, which she would definitely be exceptional at). Which is why the level of comfort they display the next day in the gallery is so much better. And I love the way he just went straight for getting a picture with her. Hyejin’s clearly ready to answer his feelings as given by her saying that she’ll see him tomorrow. And Sungjoon’s moved on from the past as seen in him avoiding meeting Hari the next day, because that’s reserved for Hyejin. Speaking of the Hari-Sungjoon dynamic, I like how Sungjoon isn’t pussyfooting around his feeling. He realizes them fully one night and prepares to tell Hari the next day. It’s going to hurt, and he knows it but he’s not going to hide the truth until he fully has the courage to say it, like someone. Because as Hyejin said, that hesitation will result in you being unable to tell the truth at all. And Hari sure finds that out the hard way. First Hyejin learns of the truth, now Sungjoon, and he definitely won’t be as forgiving as Hyejin. Sungjoon isn’t the type of person to deceive someone, regardless of his feelings on the matter. He’s straightforward and overly stoic, to a fault. She’s worldly and flighty. As such, him and Hari are fundamentally incompatible. He definitely won’t be able to understand why she couldn’t tell him the truth, if she liked him so much. But I hope that his shock and horror at not having recognized the real Hyejin won’t spill into his relationship with her. It certainly didn’t seem to be that way from the preview for ep 11, but we all know how deceiving drama previews can be. This show has done a wonderful job of not veering into noble idiocy territory and creating wonderful relatable characters and conflicts, so the last thing I want is to have it do so now. 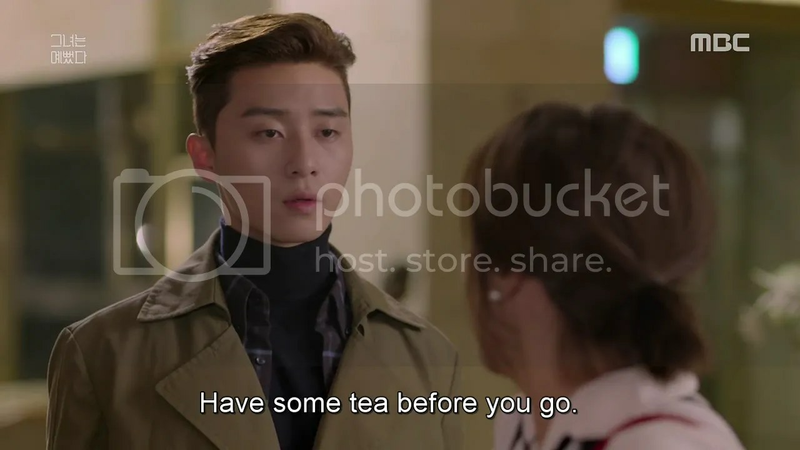 I will give props to Hari for not trying to excuse her behaviour but simply vowing to return to her proper place, because she knows where that is now, and it’s not at Sungjoon’s side. Hari’s not a bad person. She’s an exceptional worker, and has a brilliant head on her shoulders, but desperately needs genuine affection. She simply chose the wrong method to get to the wrong source. I can’t condone what she’s done, but I understand why she did it. And like Hyejin, I don’t think I can hate her for it. Shinhyuk’s the final character up for analysis and I’m pleased to note that he did more besides playing fairy godmother this week. We’re starting to get bits and pieces of who the real Shinhyuk (beneath that hilarious exterior) may be. A man with the money to buy a rather snazzy sports car, lives permanently in a hotel, and who is called on to review the work of a famous author, due to his writing skill (I’m calling it people, he’s either TEN, or Rara’s TEN and he’s the chaebol nephew). A man who cries wolf so often that no one takes him seriously. A man who has to know that no one takes him seriously due to this but behaves that way anyway. Who is seriously in love with Hyejin but never seriously goes after Hyejin because he knows she doesn’t feel the same way and doesn’t want to burden her. He’s always been there for her and she really has been there for him, but there’s never been anything he could do for her more than be a ear to listen or help her avoid Sungjoon (Hyejin madly grabbing onto Shinhyuk’s name whenever possible has never been sweeter). Sungjoon asks him why the hell he simply says nothing to Hyejin, even though he hangs around her all day and chases after her the moment he learns that she’s alone with him. But Shinhyuk, instead of getting pissed off, simply goes to Hari and tries to speed up her and Hyejin’s reconciliation process, so Hyejin can go to Sungjoon sooner. How selfless is this guy? But things finally get too much for him this episode. And it was a relief to see him give in to his feelings, because it drives me to can-crushing insanity to see him smile half-sadly, half-amusedly to himself and go on, because it reminds me of Segi all over again (excuse me while I proceed to sob uncontrollably). So watching him finally admit that YES he got into an accident trying to get to her, YES he actually likes her, YES he can’t be friends with her anymore and damn it all he’s going to hug her felt like a cathartic experience for both himself and us. Because he hasn’t kept the words inside (he has confessed to her numerous times) but he’s kept the emotion behind them bottled up. That’s why Hyejin didn’t believe him and took it as aimless flirting/flattery for her to buy him food. Shinhyuk’s emotional arc has finally begun. And it promises to be every bit as heartbreaking as Segi’s. Just don’t vanish at the end too, Shinhyuk-ah. This episode brought every truth out into the open save Hyejin’s identity, but as we’ve seen, that doesn’t even matter anymore. I seriously give props to this show, the actors and the writer for not making this (fluffy rom-com though it may be) a first-love tale. It’s the story of two people who couldn’t care less about looks and have eyes that look straight at the person inside. And that’s something that we all could learn from. Love the review for episode 10:) this is seriously my Wednesday and Thursday’s addiction. I find it so refreshing (from the preview) that the show is resolving the love triangle at such an “early” point of the show. Usually, the big reveal comes when the show is about to end and most of the time, there isnt adequate homage paid to the characters and the plot that we have fallen in love with because it becomes a slap, dash and stitch affair. wow..what a recap..i like reading your recap. Oh my gosh you’re right! I noticed that they were both red sports cars but the SAME CAR? I love MBC for doing this, honestly. That car really is awesome. It shows up in episode 14 as well!